If you have installed a program called Social Pogo, then we want to inform you that it is an ad-supported program that you should remove because it might jeopardize your computer’s security with its annoying commercial advertisements. Regardless of how well it is advertised on its website, this program’s real purpose is to make money for its developers, and its official function is nothing but a gimmick to give it a more legitimate presence. Also, its dissemination tactics involve deceptive software bundling, so you might have gotten it without even knowing about it. Please read this whole description for in-depth information about this adware. While most adware-type programs are configured to display advertisements in the form of pop-ups, banners, and coupons, this particular program is entirely different. We have tested it, and we found that it will force you to view its promotions by generating a dedicated advertising window on your desktop and opening Internet Explorer and loading promoted websites. Currently, this program’s advertising window is configured to promote Twitter and Facebook, but that may change at any time. Note that that the owners of these promoted social networks are not related with the developers of Social Pogo in any way. Hence, these developers do not get paid by Twitter and Facebook. So how does this program generate advertising revenue? Social Pogo makes its developers money by promoting websites such as Lamphouseoffers.com/redirect.php?sid=BMS&message=Please%20wait, a website that features links to all kinds of even shadier web pages. We recommend you not to visit those sites because there is no way to determine whether they are legitimate. Also, this application is set to promote a website called Skycardfinder.com which looks like some scam site. However, this program is not limited to promoting the aforementioned sites because its developers can reconfigure it to promote something else at any moment. Given the questionable nature of the aforementioned promoted sites, this scenario looks very likely. The developers have configured Social Pogo to show its ads via Internet Explorer, so regardless of your main web browser, this application will force open Internet Explorer and load its promoted URLs. Moreover, you cannot turn off this function, so you have to uninstall the program to stop the ads from popping up. Also, this application has a Graphical User Interface, which can also be used to promote various websites and its clones often do. However, this adware was configured to feature Facebook and Twitter only. So, now that you know how this works let us move on to its origins and distribution methods. Social Pogo was made an adware developer also responsible for releasing StrataBeauty, BuiltMoneyMaker, and Diet Bright, among others. The developer of these applications makes minor changes to the basic formula so that anti-malware programs would not detect it put it up for download. The developer of these applications is unknown because it does not sign its software which is an indication that the software cannot be trusted. We have received information that Social Pogo is promoted using browser hijackers that include links to Socialpogo.com (Social Pogo’s dedicated distribution website.) We have found that this program is bundled with the InstallCore installer which is commonly used to distribute malicious software. When you install this adware, the installer might also install potentially unwanted programs, such as Foxtab PDF Converter and FLV Player, as well as various browser hijackers. 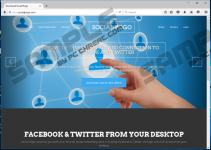 Also, we have received unverified information that this adware may come bundled with third-party software that is distributed on websites that host downloads of freeware. To sum up, Social Pogo has been classified as adware because of its ability to promote third-party content in the most annoying manner. Our research suggests that it can promote malicious content that can compromise your computer’s security and inflict undesirable consequences. Furthermore, it may promote scam websites that aim to obtain personal information and/or logins and passwords. So we highly recommend that you remove this program ASAP. Find the adware in the program list. Type Control Panel in the dialog box and click OK.
Find the program and click the Uninstall button. Find the undesirable application and right-click on it. Quick & tested solution for Social Pogo removal.